In the February 2016 issue of Elements (vol. 12, pp. 27–32), Athanassas and Wagner gave many of us our first glimpse of how dating by optically stimulated luminescence (OSL) was being used to chronologically constrain paleoenvironments and archaeological sites. The concept of luminescence dating is not new: it was initially proposed back in the 1950s. But, within the last 30 years, technological advancements have increased the power and applicability of this technique. Ann Wintle, one of the guest editors of this issue, is a pioneer in the field of luminescence dating. Ann has been at the forefront of its development since her 1974 PhD in which she combined her love of archaeology and applied physics to significantly improve on existing methods of thermoluminescence dating. Rachel Smedley, the other guest editor of this issue, is part of the new generation of scientists who continue to make great strides in improving and expanding the applicability of the technique. Now, in the February 2018 issue of Elements, Rachel and Ann have assembled a team of authors to further introduce us to this exciting field of research, one that is advancing our understanding on subjects as diverse as human evolution, mountain building, and climate change. With the start of 2018, Jonathan (Jon) Blundy joins the Elements team as a principal editor. He is taking on the mantle of petrology editor, following in the footsteps of other petrologists who have served with Elements: Ian Parsons, Bruce Watson, Hap McSween, John Valley, and Bernie Wood. Jon Blundy is an igneous petrologist and is interested in all things magmatic, from magma generation in the crust and mantle to active volcanoes and hydrothermal mineralization. His research uses a combination of field observations, thermodynamics, microbeam analysis, and high-pressure/high-temperature experiments. In the mid-1990s, together with Bernie Wood, he developed the lattice-strain model for trace element partitioning that is now widely used in the modelling of magmatic processes. 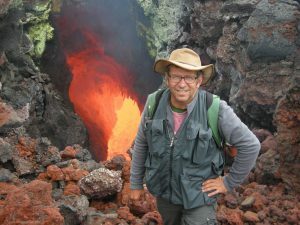 He worked on the iconic 1980–1986 eruptions of the Mount St. Helens volcano (USA) with Kathy Cashman. More recently, Jon has focused his volcanic interests on the island arcs of the Lesser Antilles, the Republic of Vanuatu, and Kamchatka. Since 2010, Jon has been engaged in industry-funded applied research into the origin of porphyry copper deposits from a volcano petrology perspective. Jon has been at the University of Bristol (UK) since 1989, where he became Professor of Petrology in 2004. He was elected Fellow of the Royal Society in 2008 and member of Academia Europaea in 2011. He is a recipient of the Clarke Medal of the Geochemical Society (1997), the Murchison Medal of the Geological Society of London (2016), and the Science Innovation Award of the European Association of Geochemistry (2016). He is one of the Mineralogical Society of America’s Distinguished Lecturers for 2018. He is a former editor of Contributions to Mineralogy and Petrology and is currently an Earth sciences subject editor for Royal Society Open Science, a new open access e-journal. We are delighted to have Jon join the Elements editorial team. Jon is already hard at work working with the guest editors and authors of the August 2018 issue on magmatism in the central Andes. Even if your institution does not subscribe to GSW, you can still take advantage of many of the above new features, especially OpenGeoSci, which is the free, public, map-based toolset.